Go on an ‘Amazing Thai-talising Food Journey’ at Grand Millennuim Kuala Lumpur for a gastronomic sour and spicy experience at the Mill Cafe. and 7pm to 10pm, daily. FROM now until May 25, three times a week, the buffet spread at the restaurant will be replaced with 33 Thai-inspired dishes. This promotion takes place on Wednesday, Friday and Saturday. Here to whip up the dishes is chef Suksan Phontun, brought in from the hotel’s sister-property Grand Millennium Sukhumvit Bangkok. 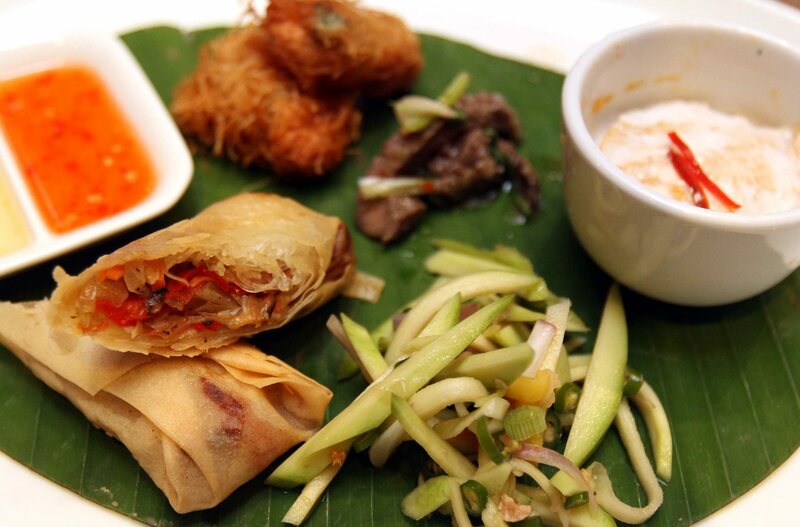 Amongst items that will be on the buffet line are the famous Tom Yam Kung (Thai Seafood Soup), Thai Green Curry Chicken, Yum Woon Sen (Spicy Glass Noodle Chicken Salad) and the traditional green papaya salad, som tam. “It was challenging at first, to work together on the menu, as it was hard for chef Suksan to visualise what works and what does not with our diners,” said executive chef Laurent Lherisson. Chefs Lherisson (left) and Suksan are proud of their tantalising buffet spread. Once the menu was completed, the chefs at the Kuala Lumpur hotel then needed to be trained by Suksan to prepare the Thai food. Being a trained chef in Western cuisine and pastry, Lherisson took the opportunity to get a few tips in Thai cooking. “My favourite is the tom yam spicy soup. It is really full of flavour, rich in spices and spicy,” he said. 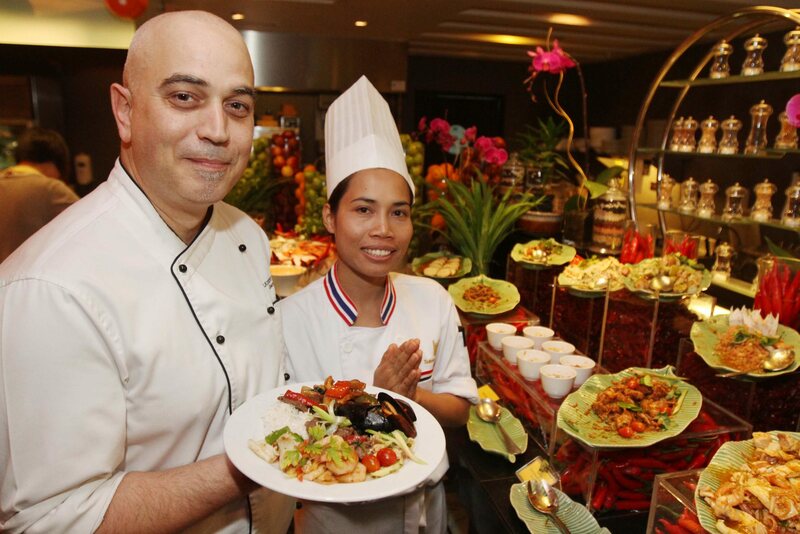 Lherisson, who has been in this industry for more than two decades, added that he now knew how to cook Thai dishes and hoped to carry on serving some Thai food as part of the buffet. Meanwhile, during this Thai food promotion, the restaurant will still be serving some of its Western dishes like pasta and pizza. “We want to give diners variety, so we decided to serve some of our dishes alongside the Thai menu,” he said. Other Thai dishes include the Tom Yam Fried Rice, Barbecue Duck Curry, Green Mango Dried Shrimp Salad and Thai Spicy Sour Mushroom Salad. Not forgetting the desserts, the guest chef from Bangkok has in line favourites such as the Mango Sticky Rice, Thai Pumpkin Custard and Lemon Grass Jelly in Ginger Syrup. There to taste and kickstart this promotion recently was Thai ambassador Krit Kraichitti along with other dignitaries from the Thai Embassy in Kuala Lumpur. “I’m happy that this Thai food promotion is taking place, as there is nothing better than food that can bring people together and help forge better relationships,” he said. He was joined by general manager Peter Gibbons and sales and marketing director Trudy Moreno. During their meal, all present were entertained with Thai classical dance performances and also Muay Thai demonstrations. Patrons who dine during the promotion stand a chance to win attractive prizes through a lucky draw competition. Prizes include return air tickets to Bangkok and hotel stays at Millennium Resort Patong, Phuket and Sukhumvit Bangkok. The buffet is priced at RM88++ per person for adults and RM44++ per child aged six and above.